The breakdown in the Dow Jones suggests more downside to come. 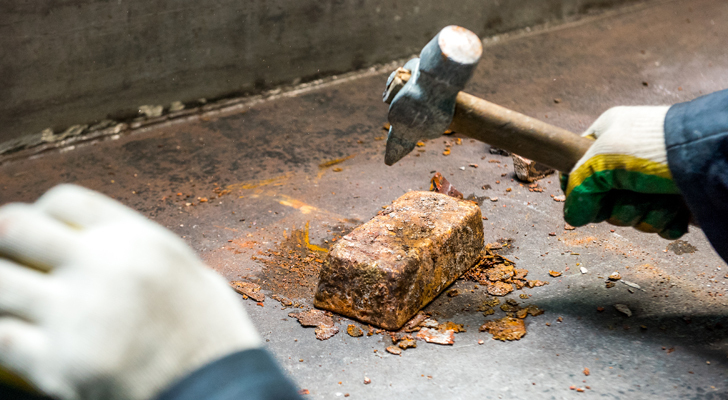 Crawl into these commodities stocks to keep your head clear. Stocks are bouncing around the unchanged line on Friday as investors contend with the drama surrounding President Donald Trump’s signing of the $1.3 trillion omnibus budget bill, China trade tariffs and the aftermath of the rather hawkish Federal Reserve policy decision on Wednesday. 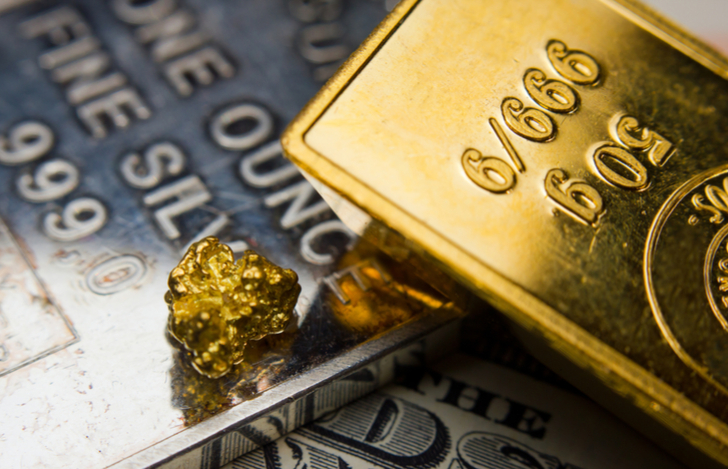 The gold and silver stocks that follow will help you keep your head clear. 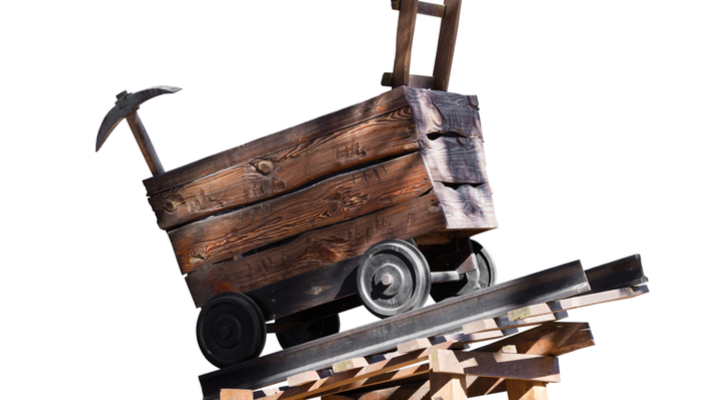 You’ll likely need to watch out for plenty of falling debris, too, as the technical breakdown in the Dow Jones Industrial Average — falling out of a multi-month wedge pattern — suggests further downside to come. Even today’s post-budget signing rally is being faded. 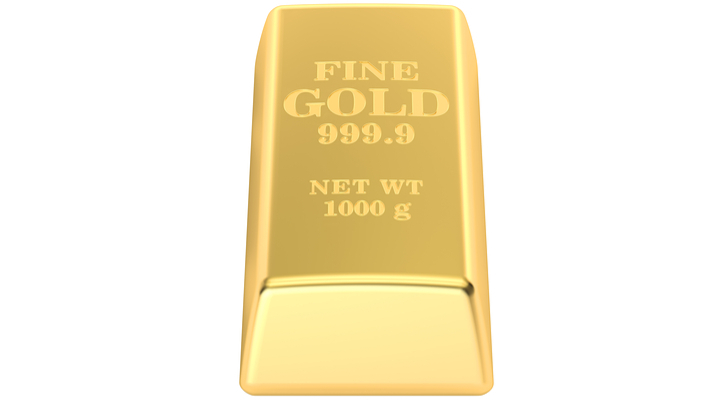 Amid the rising fear and tension, gold and silver stocks are perking up in a big way. Multiple factors are providing a tailwind, from weakness in the dollar (after China retaliated with its own tariffs) to fears that the Fed is going to let inflation get out of control. 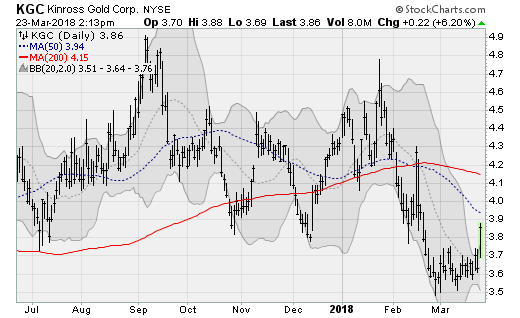 Click to EnlargeKinross Gold Corporation (NYSE:KGC) shares are peaking up and out of a two-month consolidation range to break above its Upper Bollinger Band and make a run at its 50-day and 200-day moving averages. The company will next report results on May 8 after the close. Analysts are looking for earnings of four cents per share on revenues of $820 million. When the company last reported on Feb. 14, earnings of one cent per share missed estimates by three cents on a 10.2% drop in revenues. 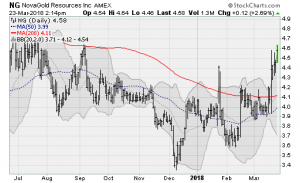 Click to EnlargeNovaGold Resources Inc. (NYSE:NG) shares are pushing to highs not seen since last summer, up 35% from the lows hit in early December. Further gains from here would break out of downtrend resistance from the high set in the summer of 2016. 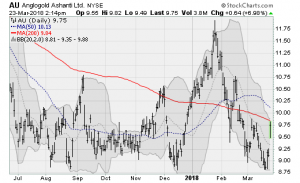 A return to those highs, around $7.20, would be worth a gain of 50%-plus from here. Analysts at B. Riley initiated coverage on the stock back in December with a Buy rating citing its 50% control of the Donlin Gold project in Alaska, which is one of the largest undeveloped gold deposits in the world. Since the project is in pre-production, they believe investors are overlooking the value in the stock. 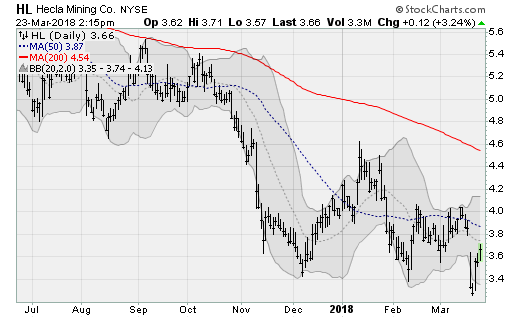 Click to EnlargeAngloGold Ashanti (NYSE:HL) shares are rallying off of three-year-long support near the $9-a-share level, taking the fight to the 200-day moving average. Watch for a run to the late January high near $11.75, which would be a gain of more than 20% from current levels. The company recently reported second half results back on Feb. 20, where earnings of 28 cents beat estimates by 10 cents (but may not be a clean comparison) on revenues of $2.3 billion. Production increased 7% from 2016 while total cash costs were up just 1%. 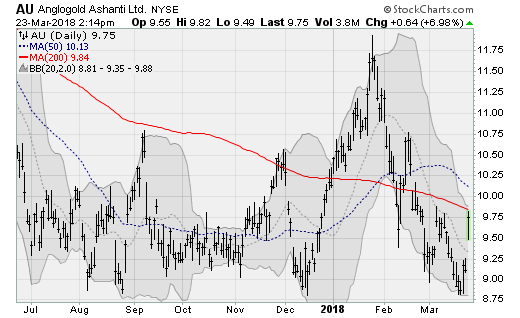 Click to EnlargeHL) shares are looking ready to rally off of multi-month support near the $3.40-a-share level ahead of a likely run to the 200-day moving average. That would coincide with a test of the January high near $4.40, which would be worth a gain of nearly 20% from here. 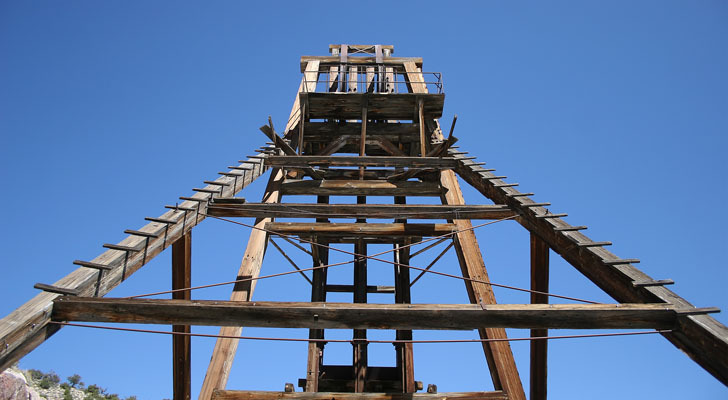 With the recent acquisition of Klondex Mines, the company will acquire three high-grade mines in Nevada. The company will next report results on May 7. Analysts are looking for a loss of one cent per share on revenues of $136 million. When the company last reported on Feb. 15, a loss of seven cents per share missed estimates by 11 cents on a 2.6% decline in revenues. 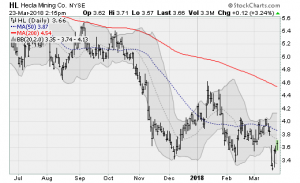 Click to EnlargeGoldcorp Inc. (NYSE:GG) shares have broken up and out a two-month congestion range and looks set for a run at the January high near $15.50 a share. That would be worth a gain of more than 10% from current levels. 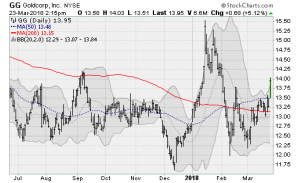 Support looks good, with shares trading at levels near $13 that have been in play since 2015. The company will next report results on April 25. Analysts are looking for earnings of 10 cents per share on revenues of $878.4 million. When the company last reported on Feb. 14, earnings of 28 cents beat estimates by 17 cents on revenues of $872.2 million. 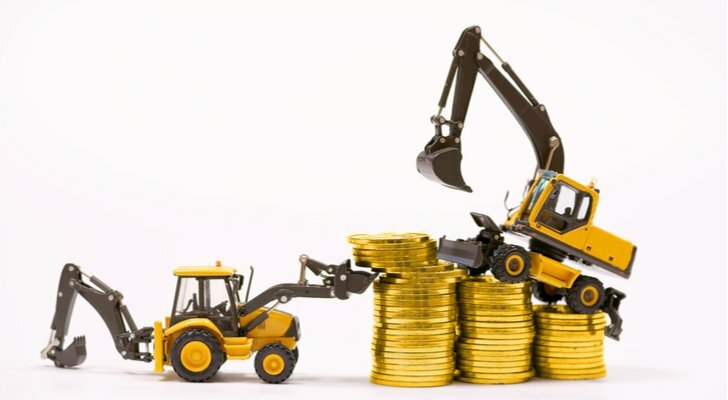 Article printed from InvestorPlace Media, https://investorplace.com/2018/03/5-gold-and-silver-stocks-on-the-table/.